To Holyoke MA On Saint Patrick’s Day Weekend. Holyoke’s Saint Patrick’s Day Parade attracts up to 450,000 spectators. The Napkin Art Show offers them an ideal occasion to commemorate the weekend. 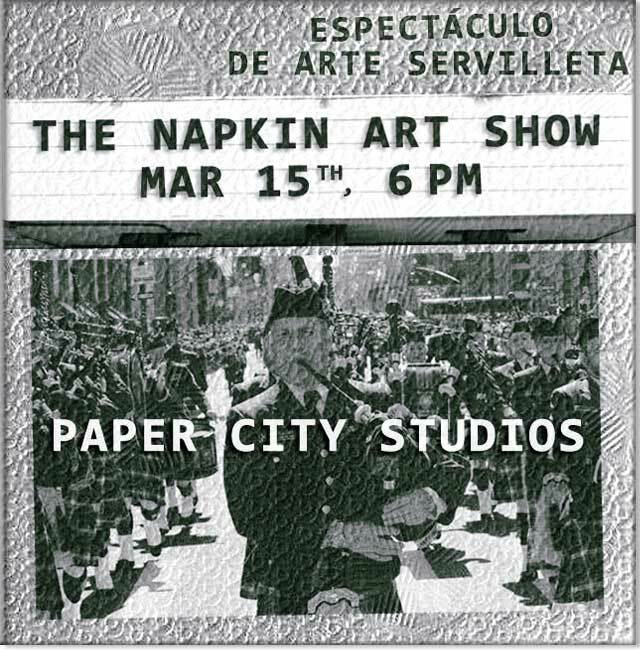 Starting Friday, March 15, Paper City Studios is pleased to host The Napkin Art Show at its spatious street level gallery, named after Paper City itself. Paper City Studios is on the 2nd downtown canal at 80 Race Street in Holyoke MA. The Napkin Art Show, which accepts art on napkins of every kind, will run during Saint Patrick’s Day Weekend. Up to 450,000 participants are welcome to show, admire, sell, discuss and purchase napkin art during Holyoke’s notorious Parade Weekend. Now in its 62nd year, Holyoke’s Saint Patrick’s Day Parade, the second largest in the nation, attracts more than 9 times Holyoke’s local population, swelling up to 450,000 spectators. The day before is the Holyoke Saint Patrick’s Road Race which packs the streets with thousands of spectators, putting the town in a frenzy. The downtown canal at Race street is where it all ties up. It’s an ideal occasion to commemorate the weekend by making, hanging, buying or selling art on a napkin. This year Holyoke has reinvented itself by marrying architecture, infrastructure and technology with the arts. The Napkin Art Show makes art-making accessible to the widest possible crowds during Holyoke’s biggest weekend. “Bring your napkin art (sketch, poetry, digital imagery, painting, etc.) that you make anytime, anywhere and in anyway. Bring friends or ask them to mail you their napkins. Here’s a chance to commemorate the weekend.” Says Kevin MacDonald who started The Napkin Art Show with the help of friends, Rosemary Barrett, Erika Knerr, Lisa Hoag and others. According to Kevin MacDonald and Bruce Fowler (Art Director Of PCS80 Gallery – Paper City Studios) napkins will sell for only 2 dollars each. 1 dollar is for the artist. 1 dollar is for the event. Anyone is invited to bring up to 50 works on napkins to include in The Napkin Art Show at no charge. The schedule starts on Friday, March 15th with time to hang napkins from 3PM to 6:30PM. The show opens for view from 6:30PM to 8:30PM. Napkins start selling at 7PM. Saturday more napkins are hung, viewed, bought and sold from 12PM to 5PM. Sunday the off-beat commemoration runs from 12PM to 5PM or later to allow everyone who comes to the Parade time to hang their napkins. Printed Matter is very pleased to host a launch for issue #129 of New Observations, the seminal non-profit art journal by artists for artists and their wider communities. The limited edition issue, titled Out of the Box – The Way of Art on the Loose, is the first new issue from the publishers after a twelve year hiatus. Join us for a reception with Publisher Erika Knerr and Guest Editor Joshua Selman on Friday, February 15, 6-8PM. Written, edited, illustrated and published by both well-established and emerging artists, the mission of New Observations is to present a diversity of editorial voices and topics from the many aesthetic and cultural traditions that constitute the arts. 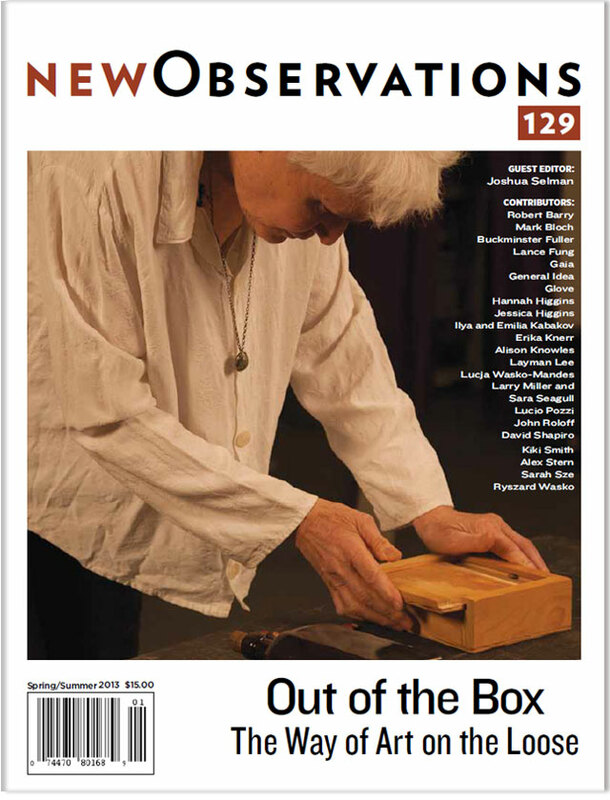 New Observations features a wide range of visual art, artists’ projects for the page, essays, poetry, and fiction. Issue #129 is packed with cutting-edge and archival content from some of the most engaging members of the New Observations community. The issue explores alternative ways in which artists have interacted with art-making and the community around them, bringing together seminal artists from Fluxus, Street Art, Correspondence Art, Contemporary Intermedia, Experimental Utopias and beyond. 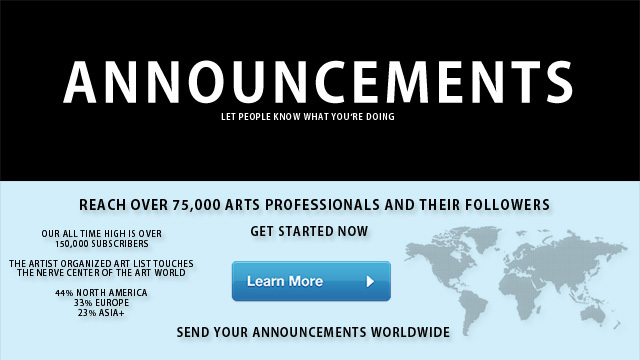 #129 presents the artists who distribute work for free or outside the normal economy of exchange. Contributors to the Issue include Robert Barry, Mark Bloch, Buckminster Fuller, Lance Fung, Gaia, General Idea, Glove, Ilya and Emilia Kabakov, Erika Knerr, Alison Knowles, Layman Lee, Larry Miller and Sara Seagull, Hannah Higgins, Jessica Higgins, Lucio Pozzi, John Roloff, David Shapiro, Kiki Smith, Alex Stern, Sarah Sze, Lucja Wasko-Mandes, Ryszard Wasko and more. Printed Matter, Inc. is Located in Manhattan’s Chelsea gallery district at 195 Tenth Avenue, between 21st and 22nd Street, New York, New York 10011. If by subway take the E or C to 23rd Street and 8th Avenue and walk west towards the Hudson River. Make a left on 10th Avenue and go downtown a block and a half. It’s on the west side of the avenue.